An index of forage quality, milk per ton of forage DM (Undersander et al., 1993), was developed using an energy value of forage predicted from ADF content and DMI potential of forage predicted from NDF content as its basis. The milk per ton quality index was later modified for corn silage (Schwab et al., 2003) using an energy value derived from summative equations (Schwab et al., 2003; NRC, 2001) and DMI predicted from both NDF content (Mertens, 1987) and in vitro NDF digestibility (IVNDFD, % of NDF; Oba and Allen, 1999b) as its basis. This milk per ton quality index (MILK2000; Schwab et al., 2003) has become a focal point for corn silage hybrid-performance trials and hybrid-breeding programs in academia and the seed-corn industry (Lauer et al., 2005). An update, MILK2006, will be discussed herein. We (Schwab et al., 2003) modified the NRC (2001) TDNmaintenance summative energy equation for corn silage to include starch and non-starch NFC components with a variable predicted starch digestibility coefficient, and a direct laboratory measure of the NDF digestibility coefficient rather energy value was derived from TDNmaintenance using the NRC (1989) empirical equation in MILK2000 (Schwab et al., 2003). In MILK2006, the NEL-3x energy value is derived using an adaptation of the TDN-DE-ME-NE conversion equations provided in NRC (2001). Neutral detergent fiber content and IVNDFD are used to predict DMI (Schwab et al., 2003) in both MILK2000 and MILK2006. However, a one %-unit change in IVNDFD (% of NDF) from lab-average IVNDFD changes DMI 0.26 lb. per day (Oba and Allen, 2005; Jung et al., 2004) in MILK2006 versus the 0.37 lb. per day value (Oba and Allen, 1999b) that was used in MILK2000. In MILK2000, variation in IVNDFD impacts NEL intake through effects on both NEL-3x content and DMI (Schwab et al., 2003). However, Tine et al. (2001) and Oba and Allen (1999a) reported that at production levels of intake, IVNDFD has minimal impact on NEL-3x content but impacts NEL intake primarily through effects on DMI. In MILK2006, the IVNDFD value used for calculating NEL-3x is adjusted for differences in DMI predicted from IVNDFD using an equation adapted from Oba and Allen (1999a). Thus, IVNDFD impacts NEL intake and hence the milk per ton quality index mainly through its impact on predicted DMI in MILK2006. Dairy cattle nutritionists have long used non-fiber carbohydrate (NFC) as a quasi-nutrient rather than starch specifically. However, NFC is a calculated value (100 − NDF − CP + NDFCP − Fat − Ash; NRC, 2001) comprised of varying proportions of starch, sugar, soluble fiber, and organic acids, and is subject to errors associated with analyzing the five nutrients used to calculate NFC. Although the NRC 2001 summative energy equation was based on NFC, starch rather than NFC is being used in summative energy equations (Schwab et al., 2003) by many commercial feed testing laboratories especially for corn silage which they have long been analyzing for starch content and have developed NIRS calibrations for starch determination. However, determining digestion coefficients for starch to use in summative energy equations has been difficult. The NRC 2001 model uses an NFC true digestibility coefficient of 98% and arbitrary processing adjustment factors. The MILK2000 model uses a non-starch NFC (NFC minus starch) true digestibility coefficient of 98% (NRC, 2001) and varies the starch true digestibility coefficient from a minimum of 76% (Firkins et al., 2001) to a maximum of 98% (NRC, 2001) using whole-plant DM and kernel processing as regression equation variables to predict apparent total tract starch digestibility (Schwab et al., 2003). Both approaches though are limited in their ability for detecting potential variation in starch digestibility across a wide array of samples, and novel lab assays are needed. Starch, supplied in Midwestern and Northeastern diets primarily from dry or high-moisture corn grain and whole-plant corn silage, is an important source of energy for dairy cattle. However, the digestibility of corn starch can be highly variable (Nocek and Tamminga, 1991; Orskov, 1986; Owens et al., 1986; Rooney and Pflugfelder, 1986; Theuer, 1986). Various factors, particle size (fine vs. coarse grind), grain processing (steam flaked vs. dry rolled), storage method (dry vs. high-moisture corn), moisture content of high-moisture corn, type of corn endosperm, and corn silage maturity at harvest, chop length, and kernel processing, influence starch digestibility in lactating dairy cows. Because both physical and chemical properties of starch influence starch digestion, assessment of starch digestibility in the laboratory has been challenging. In an attempt to address variation in starch digestibility, NRC (2001) suggested empirical processing adjustment factors (PAF) to adjust NFC digestion coefficients for high-starch feeds. However, since no system to measure variation in PAF for feedstuffs is available the PAF’s are subjective book values with minimal practical utility. For corn silage, U.S. Dairy Forage Research Center workers developed a kernel processing score (KPS; Ferreira and Mertens, 2005; Mertens, 2005) to assess adequacy of kernel processing in corn silage. But, the relationship between KPS values and in vivo starch digestibility measurements is not well defined. Ruminal in-vitro or in-situ degradation, either alone or in combination with in vitro post-ruminal enzymatic digestion of the ruminal residues, have been explored by some groups (Sapienza, 2002). Some commercial laboratories are attempting to employ in situ or in vitro systems to evaluate starch digestibility, but to date methods are highly variable between laboratories. Regardless of the method it is doubtful that samples can be fine ground as fine grinding of samples may mask differences among samples (Doggett et al., 1998). Relationships between in situ/in vitro measurements and in vivo starch digestibility are often not well defined. We recently developed an enzymatic lab assay, Degree of Starch Access (DSA), which is sensitive to differences in particle size, moisture content, and vitreousness of corn-based feeds (Blasel et al., 2006). The DSA assay was found to be quite sensitive (Blasel et al., 2006) to particle size (R2 = 0.99) and moderately sensitive to DM content (R2 = 0.76) and endosperm type (R2 = 0.59), which are three primary factors that influence starch digestibility in corn grain. However, The DSA assay is a laboratory starch recovery procedure that does not result in a direct estimate of starch digestibility and only reveals differences in starch recoveries. For example, the DSA procedure would recover 95 percent of the starch in finely ground corn but only 5 percent of the starch in whole shelled corn. Thus, the DSA values provide an index of the variation in degree of starch access among feeds. We (Shaver and Hoffman, 2006) reviewed eight trials in the scientific literature (Taylor and Allen, 2005a; Remond et al., 2004; Oba and Allen, 2003; Crocker et al., 1998; Knowlton et al., 1998; Yu et al., 1998; Joy et al., 1997; Knowlton et al., 1996) with lactating dairy cows that reported total tract starch digestibility and particle size, moisture content, and endosperm type of the corns tested. From these data, we estimated their DSA values and evaluated the relationship between DSA and their measures of total tract starch digestibility. The resultant regression equation is applied to starch recovery values generated from the DSA assay to provide an estimate of total tract starch digestibility (termed Starch DigestibilityDSA; Shaver and Hoffman, 2006) which can be used in summative energy equations (Schwab et al., 2003; NRC, 2001) directly to calculate energy values for corn-based feeds on a standardized basis. More field and in vivo evaluations of these laboratory assays related to starch digestibility (KPS, DSA, and in situ/in vitro) are needed. Therefore, the MILK2006 model continues to use the regression approach of MILK2000 (Schwab et al., 2003) as the default method for determining starch digestibility. But, user-defined options are available within the MILK2006 spreadsheet for determining starch digestibility from available KPS, DSA, or in situ/in vitro data. For hybrid performance trials where an objective is to assess true hybrid differences for kernel endosperm properties, the harvest maturity, whole-plant DM content, and sample particle size should be kept as similar as possible since these factors all influence the starch digestibility determinations. The NRC (2001) summative energy equation is based on fiber digestibility calculated using lignin. Whole-plant lignin content was found to have a strong negative relationship with IVNDFD within comparisons of brown midrib (bm3) hybrids to isogenic counterparts (Oba and Allen, 1999b). However, stover NDF and lignin contents increase while NDFD decreases with progressive maturity, but whole-plant NDF and lignin contents are constant or decline as grain proportion increases (Russell et al., 1992; Hunt et al., 1989). This may partially explain why for 534 corn silage samples, NDFD calculated using lignin according to NRC (2001) accounted for only 14% (P < 0.001) of IVNDFD variation (Schwab and Shaver, unpublished). Michigan State workers (Oba and Allen, 2005; Allen and Oba, 1996; M. S. Allen, personal communication, 2003 Tri-State Nutr. Conf. Pre-Symp.) reported that lignin (% of NDF) explained only half or less of the variation for corn silage IVNDFD. These observations coupled with the NRC (2001) suggestion that IVNDFD measurements could be used directly in the NRC model led us to implement IVNDFD rather than lignin-calculated NDF digestibility in the corn silage milk per ton models (Schwab et al., 2003). Use of NDF and IVNDFD in the corn silage milk per ton models has been discussed above. Several commercial testing laboratories offer wet chemistry IVNDFD measurements. NIRS calibrations for predicting IVNDFD on corn silage samples are available at some commercial forage testing laboratories. However, Lundberg et al. (2004) found poor prediction by NIRS of corn silage IVNDFD. It is hoped that NIRS calibration equations can be improved upon in the future. The NRC (2001) recommended a 48-h IVNDFD for use in the NRC (2001) model, and for that reason we used 48-h IVNDFD measurements in MILK2000 (Schwab et al., 2003). However, debate continues within the industry about the appropriateness of 48-h vs. 30-h IVNDFD measurements. Some argue that the 30-h incubation better reflects ruminal retention time in dairy cows (Oba and Allen, 1999a) and that most of the in vivo trials that have evaluated effects of varying IVNDFD on animal performance also performed 30-h IVNDFD measurements (Oba and Allen, 2005). Labs and their customers also like the faster sample turn around that is afforded by the 30-h incubation time point. For that reason, and also for improved lab operation efficiency, a 24-h incubation time point is being employed by some labs. However, some argue that the 48-h incubation time-point is less influenced by lag time and rate of digestion, and thus is more repeatable in the laboratory (Hoffman et al., 2003). Hoffman et al. (2003) provided data on the relationship between 30- and 48-h IVNDFD measurements that showed a strong positive relationship (r-square = 0.84). But, the lab average at a specific incubation time point and the relationship between incubation time points within a lab can be highly variable among labs making the development of a universal incubation time point adjustment equation difficult. The average lignin-calculated corn silage NDF digestibility in the NRC (2001) is 59%. This reference point is important for adjustment of IVNDFD values from different labs and varying incubation time points so that the resultant TDN and NEL values are comparable to NRC (2001) values. User-defined flexibility is available within the MILK2006 spreadsheet for entry of 48-, 30-, or 24-h IVNDFD incubation time point measurements. But, the labs incubation time point and average results for corn silage at that time point must also be entered into the spreadsheet along with the sample data. The 48-h IVNDFD incubation time point continues to serve as the default in the milk per ton spreadsheets. The Wisconsin Corn Silage Hybrid Performance Trials (Lauer et al., 2005) will continue to use the 48-h IVNDFD incubation time point because NIRS calibrations for this time point have been developed from corn silage samples obtained in this evaluation program over several years by locations and Justen (2004) did not find the earlier incubation time points to provide any benefit over the 48-h time point for hybrid selection. Values for TDNmaintenance, NEL-3x, and milk per ton calculated using MILK2006 and MILK2000 across a wide range of whole-plant corn IVNDFD values and extreme quality differences are presented in Tables 1 and 2, respectively. The TDNmaintenance differences between MILK2006 and MILK2000 are minimal. The NEL-3x and milk per ton values are lower and the range in these values is compressed for MILK2006 relative to MILK2000 according to the equation differences between the two models that were described above. Analysis of correlations between corn silage NDF, IVNDFD, starch, and starch digestibility and milk per ton estimates from MILK 2006, 2000, 1995, and 1991 models (n = 3727 treatment means; Shaver and Lauer, 2006) is presented in Table 3. Results show that the MILK2000 model was revolutionary relative to the earlier models (milk per ton hybrid rank correlation between MILK2000 and MILK1991 was only 0.68), because of its recognition of IVNDFD as an important quality parameter while the earlier models were influenced mostly by whole-plant starch and grain contents. The MILK2006 model relative to MILK2000 appears to be more evolutionary reflecting the relatively minor fine-tuning of equations (milk per ton hybrid rank correlation between MILK2006 and MILK2000 was 0.95), but the spreadsheet will allow for more user-defined flexibility. Future developments in laboratory methods for determining starch digestibility may influence its relationship to milk per ton estimates relative to the other quality measures. Ivan et al. (2005) evaluated “low-fiber” (26% starch, 49% NDF, 58% IVNDFD) versus “high-fiber” (22% starch, 53% NDF, 67% IVNDFD) corn silages in 30% NDF diets fed to lactating dairy cows. Reported per cow per day milk yields were converted to milk per ton of corn silage DM basis using their corn silage DMI data. Actual milk per ton was 168 lb. higher for high-fiber than low fiber corn silage. Model-predicted milk per ton estimates were 132 lb. and 297 lb. higher for high-fiber than low-fiber corn silage from MILK2006 and MILK2000 models, respectively. This suggests reasonable agreement with in vivo data for MILK2006 and better agreement with in vivo data for MILK2006 than MILK2000. 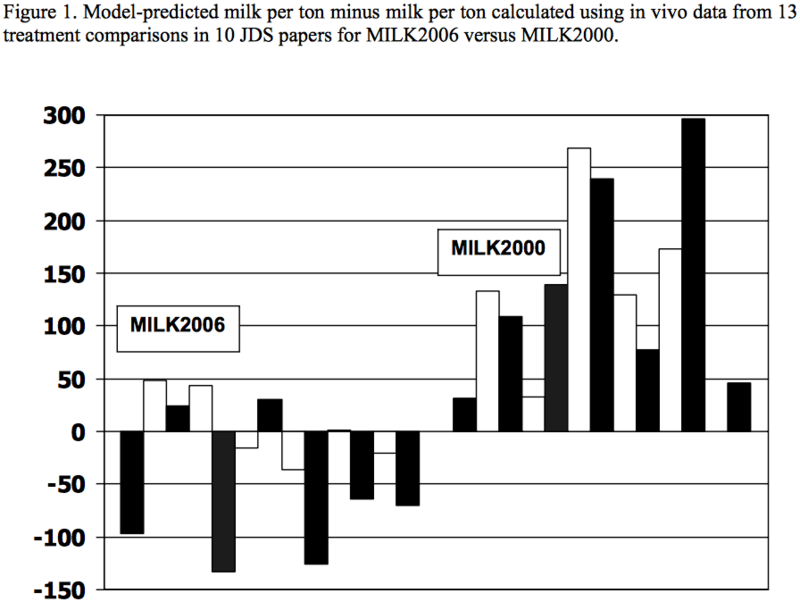 Presented in Figure 1 is model-predicted milk per ton minus milk per ton calculated using in vivo data from 13 treatment comparisons in 10 JDS papers (Ballard et al., 2001; Ebling and Kung, 2004; Ivan et al., 2005; Neylon and Kung, 2003; Oba and Allen, 2000; Oba and Allen, 1999a; Qiu et al., 2003;Taylor and Allen, 2005b; Thomas et al., 2001; Weiss and Wyatt, 2002) for MILK2006 versus MILK2000. There was less model over-predictive bias for MILK2006 than MILK2000. The model-predicted milk per ton minus in vivo-calculated milk per ton difference exceeded 100 lb. (approximately 1 lb. per cow per day) for only 2 of 13 treatment comparisons with MILK2006 versus 8 of 13 treatment comparisons with MILK2000. Allen, M., and M. Oba. 1996. Fiber digestibility of forages. Pages 151-171 in Proc. MN Nutr. Conf. Bloomington, MN. Ballard, C. S., E. D. Thomas, D. S. Tsang, P. Mandebvu, C. J. Sniffen, M. I. Endres, and M. P. Carter. 2001. Effect of corn silage hybrid on dry matter yield, nutrient composition, in vitro digestion, intake by dairy heifers, and milk production by dairy cows. J. Dairy Sci. 84:442–452. Blasel, H.M., P. C. Hoffman, and R. D. Shaver. 2006. Degree of starch access: An enzymatic method to determine starch degradation potential of corn grain and corn silage. J. Anim. Feed Sci. Technol. 128:96-107. Crocker, L.M., E. J. DePeters, J. G. Fadel, H. Perez-Monti, S. J. Taylor, J. A. Wyckoff, and R. A. Zinn. 1998. Influence of processed corn grain in diets of dairy cows on digestion of nutrients and milk composition. J. Dairy Sci. 81: 2394-2407. Ebling, T. L., and L. Kung, Jr. 2004. A comparison of processed conventional corn silage to unprocessed and processed brown midrib corn silage on intake, digestion, and milk production by dairy cows. J. Dairy Sci. 87:2519–2527. Ferreira, G., and D. R. Mertens. 2005. Chemical and physical characteristics of corn silages and their effects on in vitro disappearance. J. Dairy Sci. 88:4414-4425. Firkins, J. L., M. L. Eastridge, N. R. St- Pierre, and S. M. Noftsger. 2001. Effects of grain variability and processing on starch utilization by lactating dairy cattle. J. Anim. Sci. 79(E. Suppl. ): E218-E238. Hoffman, P. C., Lundberg, K. L., L. M. Bauman, and R. Shaver. 2003. In vitro NDF digestibility of forages: The 30 vs. 48 hour debate. Univ. of WI Extension Focus on Forage Series. Vol. 5, No. 16. https://fyi.extension.wisc.edu/forage/files/2014/01/30vs48-FOF.pdf. Hunt, C. W., W. Kezar, and R. Vinande. 1989. Yield, chemical composition and ruminal fermentability of corn whole plant, ear, and stover as affected by maturity. J. Prod. Agric. 2:357-361. Ivan, S. K., R. J. Grant, D. Weakley, and J. Beck. 2005. Comparison of a Corn Silage Hybrid with High Cell-Wall Content and Digestibility with a Hybrid of Lower Cell-Wall Content on Performance of Holstein Cows. J. Dairy Sci. 2005 88:244-254. Jung, H.G., M., Raeth-Knight, and J. G. Linn. 2004. Forage fiber digestibility: Measurement, variability, and impact. Pages 105-125 in Proc. 65th MN Nutr. Conf. Bloomington, MN. Justen, B. A. L. 2004. Digestion kinetics and vitreousness in breeding maize (Zea Mays L.) for silage yield and nutritional quality. M. S. Thesis. Plant Breeding and Genetics. Univ. of Wisconsin – Madison. Knowlton, K. F., B. P. Glenn, and R. A. Erdman. 1998. Performance, ruminal fermentation, and site of starch digestion in early lactation cows fed corn grain harvested and processed differently. J. Dairy Sci. 81:1972-1984. Lauer, J., K. Kohn, and P. Flannery. 2005. Wisconsin Corn Hybrid Performance Trials Grain and Silage. Univ. of WI Ext. Publ. A3653. http://corn.agronomy.wisc.edu/HT/2013/A3653.pdf. Lundberg, K. L., P. C. Hoffman, L. M. Bauman, and P. Berzaghi. 2004. Prediction of forage energy content by near infrared reflectance spectroscopy and summative equations. Prof. Anim. Sci. 20:262-269. Mertens, D. R. 2005. Particle size, fragmentation index, and effective fiber: Tools for evaluating the physical attributes of corn silages. Pages 211-220 in Proc. Four-State Dairy Nutr. & Mgmt. Conf. MWPS-4SD18. Dubuque, IA. Mertens, D. R. 1987. Predicting intake and digestibility using mathematical models of ruminal function. J. Anim. Sci. 64:1548- 1558. National Research Council. 1989. Nutrient Requirements of Dairy Cattle. 6th rev. ed. Natl. Acad, Sci., Washington, DC. Neylon, J. M., and L. Kung, Jr. 2003. Effects of cutting height and maturity on the nutritive value of corn silage for lactating cows. J. Dairy Sci. 86:2163– 2169. Nocek, J. E., and S. Tamminga. 1991. Site of digestion of starch in the gastrointestinal tract of dairy cows and its effects on milk yield and composition. J. Dairy Sci. 74:3598-3629. Oba, M. and M. Allen. 2005. In vitro digestibility of forages. Pages 81-91 in Proc. Tri-State Dairy Nutr. Conf. Ft. Wayne, IN. Oba, M. and M. S. Allen. 2000. Effects of brown midrib 3 mutation in corn silage on productivity of dairy cows fed two concentrations of dietary neutral detergent fiber: 1. Feeding behavior and nutrient utilization. J. Dairy Sci. 83:1333-1341. Oba, M. and M. S. Allen. 1999a. Effects of brown midrib 3 mutation in corn silage on dry matter intake and productivity of high yielding dairy cows. J. Dairy Sci. 82:135- 142. Oba, M. and M. S. Allen. 1999b. Evaluation of the importance of the digestibility of neutral detergent fiber from forage: effects on dry matter intake and milk yield of dairy cows. J. Dairy Sci. 82:589- 596. Orskov, E. R. 1986. Starch digestion and utilization in ruminants. J. Anim. Sci. 63:1624-1633. Owens, F. N., R. A. Zinn, and Y. K. Kim. 1986. Limits to starch digestion in the ruminant small intestine. J. Anim. Sci. 63:1634-1648. Qiu, X., M. L. Eastridge, and Z. Wang. 2003. Effects of corn silage hybrid and dietary concentration of forage NDF on digestibility and performance by dairy cows. J. Dairy Sci. 86:3667–3674. Remond, D., Cabrer-Estrada, J. I., Chapion M., Chauveau B., Coudure R., Poncet C., 2004. Effect of corn particle size on site and extent of starch digestion in lactating dairy cows. J. Dairy Sci. 87:1389-1399. Rooney, L. W., and R. L. Pflugfelder. 1986. Factors affecting starch digestibility with special emphasis on sorghum and corn. J. Anim. Sci. 63:1607-1623. Russell, J. R., N. A. Irlbeck, A. R. Hallauer, and D. R. Buxton. 1992. Nutritive value and ensiling characteristics of maize herbage as influenced by agronomic factors. J. Anim. Feed Sci. Technol. 38:11-24. Sapienza, D. 2002. Pioneer tripartite method: Linking nutrient content to availability. Pages 27-40 in Proc. 64th Cornell Nutr. Conf. East Syracuse, NY. Schwab, E. C., R. D. Shaver. J. G. Lauer, and J. G. Coors. 2003. Estimating silage energy value and milk yield to rank corn hybrids. J. Anim. Feed Sci. Technol. 109:1-18. Shaver, R. D., and P. C. Hoffman. 2006. Corn silage starch digestibility: What’s new? In Proc. NRAES Silage for Dairy Farms Conf. Camp Hill, PA.
Taylor, C.C. and M. S. Allen. 2005a. Corn grain endosperm type and brown midrib 3 corn silage: Site of digestion and ruminal digestion kinetics in lactating cows. J.Dairy Sci. 2005 88: 1413-1424. Taylor, C. C. and M. S. Allen. 2005b. Corn grain endosperm type and brown midrib 3 corn silage: Feeding Behavior and Milk Yield of Lactating Cows. J. Dairy Sci. 88: 1425-1433. Theurer, C. B. 1986. Grain processing effects on starch utilization by ruminants. J. Anim. Sci. 63:1649-1662. Thomas, E. D., P. Mandebvu, C. S. Ballard, C. J. Sniffen, M. P. Carter, and J. Beck. 2001. Comparison of corn silage hybrids for yield, nutrient composition, in vitro digestibility, and milk yield by dairy cows. J. Dairy Sci. 84:2217–2226. Undersander, D.J., W.T. Howard, and R.D. Shaver. 1993. Milk per acre spreadsheet for combining yield and quality into a single term. J. Prod. Ag. 6:231-235. Weiss, W. P., and D. J. Wyatt. 2002. Effects of feeding diets based on silage from corn hybrids that differed in concentration and in vitro digestibility of neutral detergent fiber to dairy cows. J. Dairy Sci. 85:3462–3469. Yu, P., J. T. Huber, F.A.P. Santos, J. M. Simas, and C. B. Theurer. 1998. Effects of ground, steam-flaked, and steam-rolled corn grains on performance of lactating cows. J. Dairy Sci. 81: 777-783.